Asbestos bodies are the histologic hallmark of exposure to asbestos [1–4]. These structures are golden brown, beaded or segmented, dumbbell-shaped objects that have a characteristic microscopic appearance that is readily recognized by the pathologist. Their identification in histologic sections is an important component of the pathologic diagnosis of asbestosis (see Chap. 4), and their presence serves to alert the pathologist that the patient has been exposed to airborne asbestos fibers. 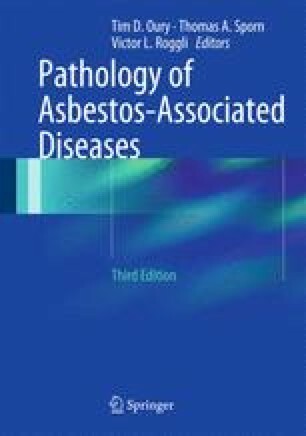 It is the purpose of this chapter to discuss the structure and development of asbestos bodies as well as their occurrence and distribution within human tissues. In addition, techniques for the quantification of asbestos bodies are reviewed, along with the relationship of asbestos body formation to the various types of asbestos fibers. Finally, the distinction of asbestos bodies from other ferruginous bodies based on light microscopic and analytical electron microscopic observations is emphasized. The identification and significance of asbestos bodies in cytologic specimens is discussed in Chap. 9, and the relationship between asbestos body concentrations in pulmonary tissues and the various asbestos-associated diseases is reviewed in Chap. 11.